Happy early birthday wishes to bellatook and thepirateship. May you both enjoy many happy returns of the day! * My unabridged narration of Karen Joy Fowler's wonderful short story "Always" is now available to stream or download on the latest episode of StarShipSofa. If you listen, I hope you enjoy! * Becky's Book Reviews is sponsoring the "It's The End of The World (As We Know It)" Reading Challenge for apocalyptic and post-apocalyptic fiction. Find out more here. * Geeky Clean's website is back, and the store has more new soaps available. Personally, I'm pining after the Browncoat Field Ration. Full details are available on the LFS press release page. 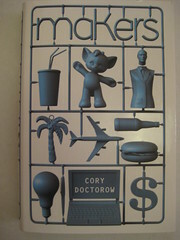 * Speaking of Doctorow's Makers, he is now offering the audiobook DRM-free for purchase at his website. Is wholesome even for the King." “‘Repent, Harlequin!’ Said the Ticktockman,” is one of my all-time favorite short stories. Jellybeans, I say! They're here! They're here! You're next! ... Oh, not that kind of pod people. Thanks very much! This is one of my much older narrations - I probably recorded this more than a year ago - but the story's really stayed with me. I don't recall that I did much in the way of special voices (as I did in "Bridesicle" or Nancy Kress's ""The Flowers of Aulit Prison"), but I remember really enjoying the story itself. I hope you enjoy it. What is this "IF you listen" business? :) "Always"... as in I "always" listen and enjoy! Except it always takes me a while to get around to it.